​We need forests we can get lost in; trees that make us gape; streams we can drink from. ​Wild places sustain and define us; we, in turn, must protect them. This is an example of forest in the Greenwood project that was approved for oak woodland management. This article was published in the Winter 2018 edition of our Newsletter. Here is a link to our Newsletter archives. Our fight over the Greenwood project came to an underwhelming and, for the most part, disappointing conclusion at the end of October, 2017. Kentucky Heartwood worked for more than three years to see the project turn from a typical timber harvest toward a science-based plan that would support the restoration of relict, fire-adapted open forest communities as well as the recovery of large areas of old-growth. In July 2017, the Forest Service issued their Draft Decision Notice and Finding of No Significant Impact – a preliminary approval of the project. Kentucky Heartwood then filed a detailed, 32 page predecisional objection (a formal administrative objection) detailing a wide range of issues, concerns, and failures in the Forest Service’s analysis. In October, we had a formal meeting with Forest Service officials to seek resolution to the concerns raised in our objection. The meeting was scheduled for two hours but stretched to four hours as we delved deep in to the issues. The meeting was somewhat constructive. In the end, the Forest Service did agree to some small changes, and made overtures toward more careful planning in the future. While the Forest Service did not agree to go back and actually survey the project area for rare species and communities, they stated that they planned to receive increased training from the Kentucky State Nature Preserves Commission (KSNPC) on how to identify rare communities, would look for rare communities during project implementation, and adjust management accordingly. They also committed to consulting with KSNPC and Kentucky Heartwood in taking a closer look at management opportunities in the 751 Roadsides/Curt Pond Ridge area – a hotspot for Cumberland barrens remnants that are in desperate need of careful, active management, as well as possible remnant barrens sites in the Blue John area. Another point of resolution that was addressed was the Forest Service’s prior unwillingness to provide clear targets for native versus non-native plantings in 75 wildlife openings covering 222 acres. The Forest Service has now formally clarified that they will manage for 35% in cool season grasses and grains, 20% in native pollinator mixes, and 45% in native grasses. While we would rather see all of the area managed for native vegetation, this is a clear improvement over the current condition and the vague statements made throughout the analysis. With regard to the proposed broadcast spraying of herbicides in wildlife openings, the Forest Service has agreed to apply herbicides only after vegetation has been cut down or is otherwise out of flowering in order to avoid impacts to native pollinators and birds, and to spray no more than 33% of the total acreage in a given year. Again, this is not what we wanted, but it is a meaningful improvement. These changes are in addition to those that came about between the original 2014 scoping document and publication of the Environmental Assessment in early 2017. Those changes included reducing the amount of logging by about 600 acres (including eliminating logging that was planned at the trailhead to the Three Forks of Beaver Creek overlook) and the elimination of 26 miles of bulldozed firelines. otherwise. Meanwhile, intact, closed-canopy hardwood forests will be cut to “restore” open-canopied and pine forests, with 139 log landings cleared and compacted to facilitate the removal of timber on over 2,000 acres. Over the coming years we will closely monitor implementation of the project. Some species and forest communities will likely benefit – particularly if the proposed fire management is implemented carefully for appropriate, site-specific ecological responses. However, there will certainly be negative impacts, disruptions, and trade-offs for years to come. To learn more about the ecology of the Greenwood area and our efforts to affect change on this project, please see our Summer 2016 and Summer 2017 newsletters, as well as our comments and predecisional objection, all of which are available on our website (scroll on down for this info). ​Kentucky Heartwood has filed a formal administrative objection (“pre-decisional objection”) challenging the approval of the Greenwood Vegetation Management Project on the Daniel Boone National Forest in McCreary and Whitley counties. This project would be the largest timber project on the Daniel Boone in 13 years, and would allow commercial timber harvests on over 2,500 acres of public lands, along with a wide range of other management actions including the construction of 139 log landings, planting of shortleaf pine, herbicide use, and over 10,600 acres of prescribed fire. The objection focuses on the Forest Service’s unwillingness to focus restoration activities in areas most impacted by the severe southern pine beetle outbreak that lasted from 1999 to 2001. The objection also addresses the agency’s failure to survey for many rare, declining, and threatened species, as well as their lack of adequate consideration in the Environmental Assessment for how management could harm or benefit these species. “Instead of focusing restoration efforts where they’re most needed, the Forest Service is going where the timber is. This is a case of genuine restoration needs getting sidelined by the Forest Service’s continued emphasis on logging,” said Jim Scheff, Kentucky Heartwood’s Director. National forest lands in the Greenwood project area are home to a wide range of rare and declining species, as well as unusual, rare natural communities including native grassland remnants, sandstone glades, and Appalachian seeps. Fire suppression and past logging have degraded many of these habitats, and appropriate management could help toward the recovery of some species. Both Kentucky Heartwood and the Kentucky State Nature Preserves Commission repeatedly requested that the Forest Service survey and manage for state-listed threatened and endangered species, including rare wildflowers like Quill flameflower, Eastern wood lily, Appalachian sandwort, and Eastern silvery aster. 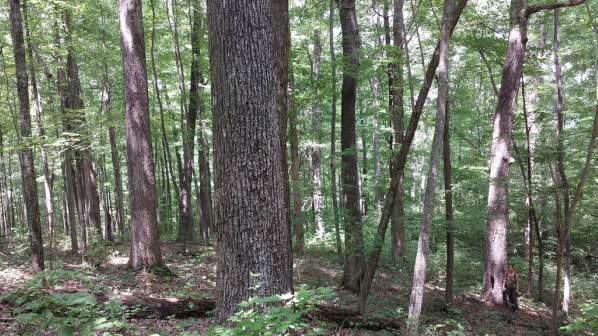 The Forest Service asserts that they are not required to survey or manage for these species – a contention that Kentucky Heartwood has challenged in the objection. “There are real opportunities to get this right. But the Forest Service needs to take a step back and re-evaluate their plans,” said Scheff. The project also includes 222 acres of broadcast spraying of herbicides in wildlife openings, a matter of particular concern to some area residents. “There are always trade-offs in land management. But we don’t think it’s acceptable to log thousands of acres of our public lands in the name of restoration, all the while ignoring many of the species and sites most in need of help,” Scheff added. Kentucky Heartwood was joined in their objection by the Center for Biological Diversity and area residents Elizabeth and Michael Loiacono. Kentucky Heartwood was founded in 1992, and seeks to protect and restore the integrity, stability, and beauty of Kentucky’s native forests and biotic communities through research, education, advocacy, and community engagement. 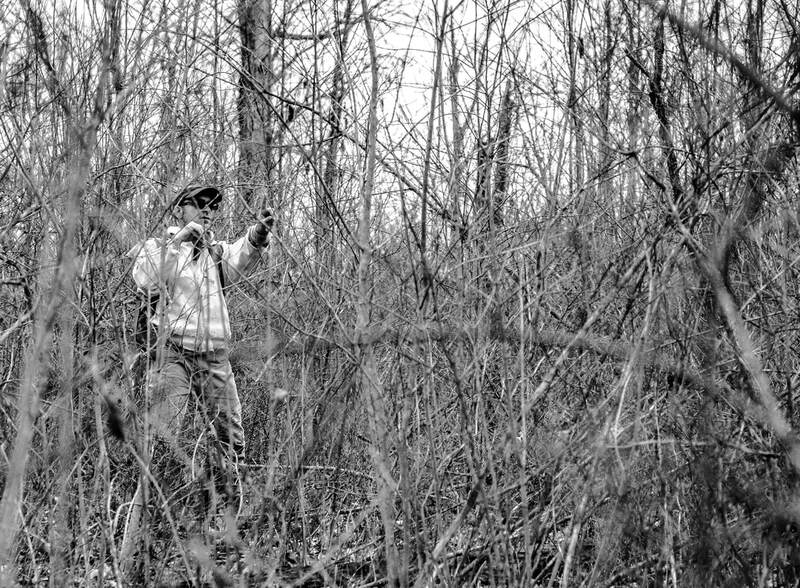 Jim Scheff measuring basal area in a briar-choked former pine stand in the Greenwood project area. This stand was not proposed for management in the project. This article was published in the Summer 2017 edition of our Newsletter. Here is a link to our Newsletter archives. It’s been three years since the Forest Service released their proposal for the Greenwood project. With several thousand acres of proposed timber harvests, it is the largest and most ambitious logging project on the Daniel Boone National Forest in more than a decade. The Environmental Assessment (EA) was released for comment in February, and at this time we are awaiting publication of a decision or modified EA from the Forest Service. Much of the project is predicated on establishing or restoring shortleaf pine and fire-adapted oak woodland community types in northern McCreary and southern Pulaski counties. The limited accounts of pre-settlement conditions, remnant plant communities, and reasonable inferences from the existing landscape strongly suggest that botanically rich, fire-adapted open barrens and woodland communities were an important component of the historical landscape. However, the Forest Service’s plans miss the mark, emphasizing commercial logging opportunities over effective landscape restoration. 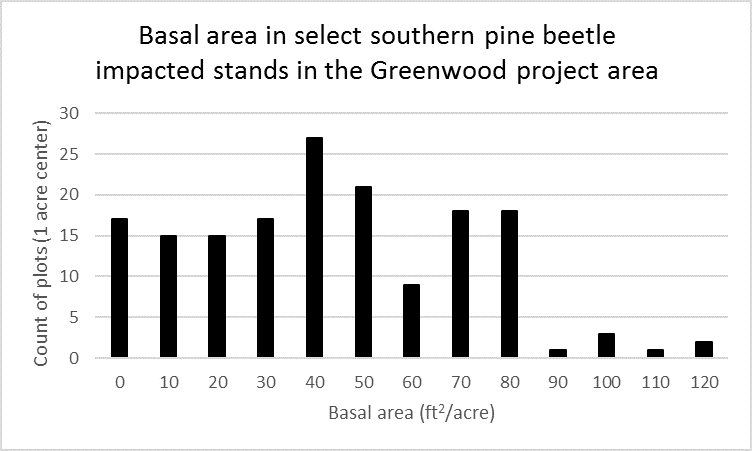 From about 1999 through 2002, an unusually severe outbreak of the native southern pine beetle (SPB) killed pines across much of the Daniel Boone, including an estimated 10,000 acres of the Greenwood project area. The Forest Service proposes to “restore pine” on 663 acres through logging of residual hardwoods and planting of shortleaf pine. Unfortunately, rather than work with the areas most impacted by the SPB, many of the proposed restoration sites are closed canopy oak and hickory forests that only had a small component of pine prior to the SPB. Large areas of severely impacted forest will be left unmanaged under the current proposal. Another 647 acres across 20 locations within the project area are proposed for a “Woodland Establishment” prescription. Woodlands are fire-mediated forest-grassland-shrub communities with a sparse, open canopy of oaks, hickories, and pine. Typical closed-canopy forests in our region have a “basal area” of about 90 to 130 square feet per acre. Basal area is the cross-sectional area of all trees at a height of 4.5 feet within a given area, and is a useful value for understanding the volume and density of trees in a forest. ​The woodland prescription aims to log trees in closed-canopy oak stands to reach a basal area of 30 to 50 square feet per acre. In other words, about half to three-quarters of the trees would be harvested. The Forest Service has asserted that no forests having the target basal area for woodland establishment exist in the project area, and therefore must be created through logging. However, the SPB outbreak left large areas of hardwood stands with varying distributions of open canopies. Despite years of dialogue, including joint field visits, collaborative work through the Cumberland River Fire Learning Network, and the submission of written comments, the agency continued to ignore the facts on the ground when they published the EA earlier this year. 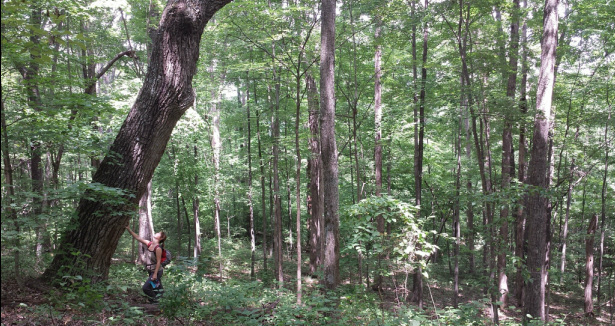 To make a more substantive, data-driven case for focusing management on areas already impacted by natural canopy disturbance, Kentucky Heartwood collected data in the field using standard forest inventory methods. Using satellite imagery and direct knowledge of conditions on the ground, we selected several areas for measurements of existing basal area. Over several days in April we measured basal area in 164 plots on 1-acre centers, covering seven areas mostly in the Blue John, Bauer, and Curt Pond Ridge areas. A great deal of the area that we covered was choked with briars, and a combination of prescribed fire and arson at some sites left the standing trees badly damaged and in decline. None of the areas that we surveyed are proposed for woodland establishment or pine restoration, despite their having basal areas within the target ranges for both prescriptions. Some of the areas surveyed are rightly proposed for prescribed fire, while others are not. Some of the most extensive areas exhibiting very low basal area had good plant community indicators of historically fire-adapted woodland or barrens community types (e.g. blackjack and post oaks), but are being left completely unmanaged and are now trending toward a high proportion of red maple. These sites would be excellent candidates for restoration efforts, which would be non-commercial, since the trees that would be thinned are too small to be of any commercial value. In contrast, we’ve documented nearby north-facing, mesic forests with large trees that have been proposed for woodland establishment through commercial timber sales and fire. The historical ecology of the Greenwood project area suggests that active management, including prescribed fire, midstory thinnings, and other activities, could be beneficial to preserving some of the area’s historical biodiversity. However, as is often the case with U.S. Forest Service projects, the emphasis on commercial timber harvest has skewed restoration opportunities away from where it is needed most. It is unclear if the Forest Service will modify the proposal based on our comments on the EA. We hope that they do. If not, opportunities to negotiate changes can still happen through the predecisional objection process. We’ll keep you posted. Save Beaver Creek Wilderness! Stop Greenwood! sign up to receive email alerts. The U.S. Forest Service, on July 18, 2014, proposed the largest timber sale on the Daniel Boone National Forest in a decade. The Greenwood Vegetation Management Project in McCreary and Pulaski counties proposes, among other management actions, more than 3,600 acres of commercial timber sales. Making matters worse, on this 50th anniversary of the Wilderness Act, the Forest Service has included more than 1,100 acres of commercial timber sales, and another 719 acres of non-commercial tree cutting, within a quarter mile of the Beaver Creek Wilderness. If the Forest Service isn't stopped, visitors to this smaller of Kentucky’s two federally designated Wilderness Areas will be greeted by the sounds of chainsaws for years to come. Other management actions include midstory removal on 631 acres, crop tree release on 1,992 acres, and prescribed fire on 15,200 acres. Project documents can be found on the Daniel Boone National Forest web page. Kentucky Heartwood has produced more detailed maps (georeferenced PDFs) that can be viewed and downloaded at the bottom of this page. Large chestnut oak in proposed logging area. The Greenwood Project area encompasses one of the more significant areas of contiguous national forest in Kentucky. It includes the 4,877 acre Beaver Creek Wilderness, and is home to a wide range of threatened, endangered, and other at-risk species, including Blackside dace, Indiana bat, Northern long-eared bat, Wood lily (Lilium philadelphicum), Eastern silvery aster (Symphyotrichum concolor), and others. The locally extinct, endangered Red-cockaded woodpecker was found here until its mature pine habitat was over-logged by the Forest Service and then decimated by the southern pine beetle outbreak of 1999-2000. Other charismatic species in the area include black bear, bobcat, mink, and the elusive spotted skunk. In addition to Beaver Creek and its tributaries, affected streams in the northern part of the project area include Neely’s Creek, Martin Creek, and Cave Creek – these are losing streams which disappear into sensitive, subterranean karst (underground cave) habitat before reaching the waters of the Cumberland River. Despite the history of coal mining and logging – including more than 4,100 acres logged by the Forest Service since 1980 – this vital core of the Daniel Boone National Forest offers a significant opportunity for landscape-scale preservation, ecological integrity, and wildness. You can comment on this project. Comments influence the decision-making process. The Forest Service was accepting comments on the project until August 18, 2014. Another comment period will happen after the Forest Service reviews these comments and issues an Environmental Assessment on the project. This process can take several months or more. Stay informed! Click here to get email alerts from Kentucky Heartwood. And please consider supporting Kentucky Heartwood with a donation! We really can't do this without you! Sunset view from Three Forks of Beaver Creek Overlook. Some of the ridges in the background are proposed for logging. Beaver Creek Wilderness is unusual in its boundary. The designated Wilderness includes only lands below the canyon’s cliffline, and so follows the dendritic pattern of Beaver Creek and its entrenched tributaries. While it is easy to find solitude and inspiration in the hidden depths of forest beneath the canyon walls, in many places the Wilderness is less than a half-mile in width. With very few exceptions, the Forest Service is prohibited from logging, burning, or using herbicides in Wilderness areas. However, the Forest Service has proposed more than 1,100 acres of commercial logging and another 719 acres of non-commercial tree cutting within a quarter mile of the Beaver Creek Wilderness boundary. If the Greenwood Project is approved, the wilderness character of the Beaver Creek Wilderness will be assailed for years by the unavoidable drone of chainsaws in the forest. It is audacious that the Forest Service would propose to impact one of Kentucky’s only two Wilderness areas in this way, but even more so during this 50th anniversary year of the Wilderness Act. Logging in the Brushy Ridge Project in Jackson County. Many Americans are surprised to learn that the Forest Service sells timber from our public, national forests. Making this practice more outrageous is the fact that the federal government loses money selling public timber. But through a complex, bureaucratic budget structure, the Daniel Boone National Forest actually increases its budget by losing money on timber sales. Despite overtures towards forest health and ‘resiliency,’ there are very few instances where commercial logging is necessary, or where the potential benefits outweigh the inevitable ecological impacts. Logging roads, skidder trails, and log landings compact soils and spread invasive species, while dragging logs through the forest often leaves remaining trees with stripped bark and damaged root zones. Logging removes biomass and nutrients from the forest, increases carbon outputs, and hinders forests’ recovery and development into future old-growth. While Kentucky Heartwood supports careful, lower-impact logging on private forestlands, we believe that our public, national forests should be spared logging’s impacts. Kudzu growing on the edge of a proposed logging unit. Throughout the Greenwood Project are established infestations of some of our most problematic invasive species, including kudzu, lespedeza, autumn olive, microstegium, tree of heaven, and Japanese honeysuckle. It is well documented that opening the forest canopy and exposing soils with logging roads, skidder trails, and log landings creates optimal conditions for invasive plants to become established and flourish. Indeed, many stands proposed for logging have populations of these plants already established along their edges, awaiting the opportunity to move into the forest interior. While the Forest Service says that they will treat invasive species with herbicides as part of the Greenwood project, it is inevitable that by logging the forest these species will spread. Why should our forests be put at risk, and why should we pay for herbicides to be sprayed extensively around the forest to “clean up” after unnecessary, tax-payer subsidized timber sales? Rattlesnake master growing in burned forest. The use of prescribed fire in our national forests is a complex, controversial, and often divisive issue. Some oppose prescribed fire because, in our region, it is essentially a human-caused form of disturbance and, in that sense, is not “natural.” Others, including the Forest Service and The Nature Conservancy, treat it as a panacea that follows historical practices used by Native Americans for thousands of years. The actual role of fire, and the scientific and historical record, is more nuanced. There is good historical and botanical evidence that fire played an important ecological role in the portion of the Cumberland Plateau represented in the Greenwood Project area, and there is also sound reasoning to support the position that significant portions of the landscape should be left unburned. There are several species and community types in the Greenwood Project area that require or benefit from the conditions created by fire. Lucy Braun describes the uplands in this general area in her seminal work Deciduous Forests of Eastern North America (1950) as a mix of oak, oak-hickory, oak-tulip, and oak-pine forests with a generally dry aspect and few shrubs. She states that “some of the promontories are occupied by open pine woods (the three species of pine [shortleaf, pitch, and virginia]) with a grassy layer of Andropogon scoparius (Little bluestem), A. glomeratus (Bushy bluestem), and Sorghastrum nutans (Indian grass).” Some openland species, like Wood lily (Lilium philadelphicum), Eastern silvery aster (Symphyotrichum concolor), Pitch pine (Pinus rigida), and the Slender glass lizard (Ophisaurus attenuatus longicaudus) are rare or disappearing in the absence of the types of habitats promoted by fire. Historically, megafauna like bison may have played an important role that was then mimicked or modified by fire. And while Native Americans settled more prominently in the wider river bottoms along the Cumberland River well to the northwest (west of Somerset) and east (near Williamsburg), an ancient game trail followed by Native Americans, known as the Tennessee, Ohio, and Great Lakes Trail, traversed this part of the Cumberland Plateau generally following what is now US 27. The trail connected the broader portions of the Plateau near Crossville, TN with the rolling terrain of the Bluegrass Region and Ohio and beyond. It stands to reason that, along this corridor, the development of the mixed deciduous and oak-pine forests following the end of the Pleistocene ice age was influenced by browsing along with variable and sporadic fire regimes. However this doesn’t mean that the entire landscape (or even all uplands) burned in the past, or that it should burn on a regular basis. The forest contains many fire-sensitive species and species that can only handle (and perhaps benefit from) infrequent fire. And in order to burn the forest, the Forest Service must build many miles of firelines, including 64 miles using bulldozers, graders, and excavators for the proposed Greenwood project. It should also be made clear that efforts to burn the forest are still very much experimental, and should not be treated as a settled science. Across the 32,000 acres of national forest in the Greenwood Project area, the Forest Service has proposed 15,200 acres of prescribed fire, in addition to nearly 2,800 acres of ongoing burns from other projects. This represents more than half of national forest lands in the project area, and the vast majority of upland forests. The Forest Service is already burning more than 11,500 acres across the Stearns District, and across the Cumberland River, the Forest Service is preparing to implement more than 40,000 acres of prescribed burns across the London District. These projects together add up to over 66,000 acres under active burn prescriptions (in additions to common incidents of arson) in just these two southern Districts. Kentucky Heartwood is urging caution and a more limited, site specific approach to prescribed fire in the Greenwood Project. Woodland on Curt Pond Ridge resulting from wildfire, prescribed fire, and southern pine beetle. No logging needed! Related to the issue of fire is that of woodlands. Woodlands are considered to be fire-modified forest communities with an open canopy – they typically have only about one-third to one-half of the canopy coverage of an average closed-canopy forest. A number of plant, avian, and other species benefit or rely upon this type of habitat. Natural or historical woodland communities are the result of a combination of canopy disturbance (like wind, ice, or insects), fire, and probably browsing. The Forest Service insists that little woodland habitat exists in this part of the Daniel Boone National Forest, and therefore they must log to create it. However, thousands of acres in the project area and vicinity have or are developing woodland characteristics as a result of windstorms, the southern pine beetle, and both prescribed fire and wildfire. The Forest Service can and should manage for woodland and similar habitats, without logging, by taking advantage of existing natural disturbance. It is also important to note that the Forest Service and The Nature Conservancy have been advancing a model that says nearly all of the forest in this area (outside of ravines) should be open woodland, savannah, or grassland. By contrast, Lucy Braun, who studied the area in the 1930s and 1940s, fails to describe the forests as having significant amounts of open canopy structure. She describes some fire-modified forests, but not the dominance of open-canopy forests promoted by the Forest Service and The Nature Conservancy. There is no need to waste money, spread invasive species, and carve up intact forest with timber sales to meet this habitat objective. Large maintained wildlife opening on the edge of Beaver Creek Wilderness. The Greenwood Project area includes 75 maintained wildlife openings totaling 222 acres. The Forest Service has proposed to broadcast apply the herbicide glyphosate to kill and replace existing vegetation (mostly fescue) with “wildlife plot mixes, native grasses, or pollinator mixes.” Native plantings would be maintained by mowing or fire, while non-native wildlife plot mixes would be allowed to go fallow after 5 years. Kentucky Heartwood opposes the deliberate planting of non-native plants in our national forest, and we believe that the Forest Service, if these openings are to be maintained, should convert them to native grasses and forbs. However, we do not support the broadcasting of herbicides across 222 acres to achieve this goal, and we are especially opposed the use of herbicides in order to plant more non-native vegetation. 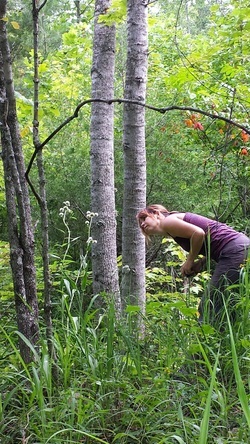 The Forest Service also plans to use herbicides to spot-treat non-native invasive plants. Kentucky Heartwood acknowledges that some invasive plant species in some areas of concern may only be effectively controlled using herbicides (which we qualify as a regrettable tool of last resort). However, the combined use of herbicides on existing infestations, new infestations from logging many thousands of acres, and broadcast on 222 acres of wildlife plots is not acceptable. The following maps of the Greenwood Project area were produced by Kentucky Heartwood using US Forest Service and publicly available data. Kentucky Heartwood makes no warranty regarding the data presented. You can download the full size georeferenced PDF maps onto any GPS enabled smartphone or tablet and navigate the project area yourself using free PDFMaps app. It's a great tool to use.